“A Mathematical Model for the Determination of Total Area Under Glucose Tolerance and Other Metabolic Curves”, Mary M. Tai, Diabetes Care, 1994, 17, 152–154. You can find comments on many blogs about it, most of them along the lines of “turns out calculus was invented in 1994”. I think it truly is a bit sad that the paper made it past the researcher, her immediate colleagues and friends, a Yale professor of electrical engineering who is thanked for “his expert review”, and most importantly reviewers, without someone giving the author a hint. In my opinion, the most optimistic view is to see it as an educational paper: the method is not new, but that particular medical community didn't know about it, so it was worth publishing. However, that is not what the paper states: the author clearly presents the method as new and names it after her. Okay, I think I have explained the context. My question is: after that peer-review failure was exposed, what should have happened to the paper? What happened is that the same journal published a series of comments on the paper, and a reply by the author to the comments. Was that the correct/ethical way of handling the issue, as an editor? Or should the paper have been retracted? The answer to this question depends on what we should term a peer-review failure. There are tons of journals in the academic market: some journals are happy to publish results as long as they are correct even if they do not push the boundary of innovation. There are some journals that are happy to publish unsound experimental work, and on the other hand, some that encourage theoretical models that are severely impractical and are essentially mathematical mumbo-jumbo. Publishing something blindingly obvious even to a high-school student is ridiculous, but we could infer two things: one, the editor and the reviewers had not found this so obvious, and two, the journal did not (or does not?) have high standards on innovation anyway. Given it is a field that potentially could have practitioners who know not a thing about calculus, the publication should not come as a big surprise. The reality is that publication of known facts is not all that uncommon in academia. The hoo-ha over this paper is basically because of the elementariness of the concept. One could expect apologies from journals for wrong results but not necessarily for stale ones. EDITORIAL NOTE: Citing this paper as "Tai's method" is strongly discouraged, as the method is actually known under the name of trapezoidal rule. See also Comments for further explanations. The academic community affected by this rediscovery should have taken actions accordingly, and editors in other journals should have made sure that citations to the paper are only given if something other than the trapezoidal rule is being discussed. John Paul II apologized for a number of misdoings by the Catholic Church. The editors should've apologized to their research community for committing this peer review failure. It's OK to be wrong from time to time; science moves by rectifying things that come into contradiction with other bits of knowledge. However it's not OK to withhold knowing that you are wrong and insisting on it. Personally, if I had anything to do with the acceptance of a paper such as this, I'd want to suppress any knowledge that I had anything to do with this paper at all as thoroughly as possible. I would certainly hope that in such a case the author in question would be so embarrassed by "rediscovering" something known for hundreds of years that the author would willingly retract the paper. But if that has not happened, there's not much that can be done. The peer-review process failed, but it would be up to either the journal editor or the author to demand retraction. Newton and Simpson are dead, and nobody else could realistically make a claim to be "injured" by this momentous "discovery." If you want to ask the question must the paper be retracted, then the answer is no, unless there was actual bias or foul play in the peer review process. If the reviewers knew there was a problem, and intentionally allowed the paper to move forward, then a retraction is necessary. Otherwise, though, the paper should not de rigueur be retracted. It should be shunned by the academic community, however, and people should refrain from citing it (except perhaps for articles and works showing how not to do research!). There is an even a bigger problem than the lack of innovation, with this paper. Any academic publication is a form of communication within a particular scholar community. If that community is not aware that a mathematical tool known for ages can solve one of their problems, there certainly is some merit in pointing that out. Maybe not enough to name the tool after her, but still enough to acknowledge her with citations. However this is not the case, here. I was so curious to check out those other methods she claims having superseded with her "invention", that I decided to have a quick look at a couple of them. I was particularly interested in the method that apparently gives only 3% of the true value (!). Well, it turns out the number obtained with this method is not at all meant to be an estimation of the area under the curve: to make the calculations simpler the authors simply decided to take out a time factor, which in their study was always the same. 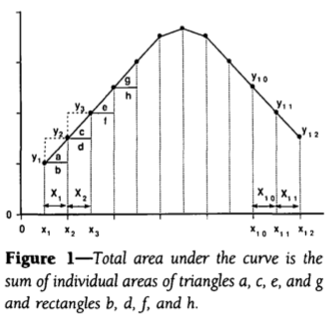 As for the other method, it was yet another implementation of the trapezoidal rule, with the addition of some complications due to medical considerations about the correct time interval that should be used, which she obviously misinterpreted. Basically everyone in her field was using the same algorithm, but she didn't realize it, and to prove her point she completely misrepresented the work of the authors she cited. I think the reviewers should have spotted that even if they didn't know anything about the trapezoidal rule! When an author builds an argument using the work of other researchers, the reviewers must always check whether this work is presented fairly or not. Not the answer you're looking for? Browse other questions tagged publications ethics retraction or ask your own question. Can a research publication have a bad impact on your career? So what happened to Episciences? What should I do if I have published a paper that I did not write?